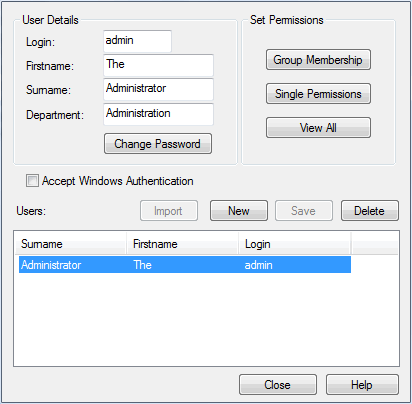 The Administrator can set or change any user's password, on the Maintain Users dialog. A user must have Change Password permission to change a password; the initial Admin administrator automatically has this permission. Select the Project | Security | Change Password menu option. The Change Password dialog displays. In the Enter old password field, type your current password. In the New password field, type your new password (this must be 12 characters or less in length). In the Retype new field, type your new password again, for confirmation. A 'Password Changed' message displays. Click on the OK button to clear the message. Your new password is effective next time you log in. Select the Project | Security | Manage Users menu option. The Security Users dialog displays. Click on the user name in the Users: panel, to display the user details in the dialog fields. Click on the Change Password button. The Change Password dialog displays. In the New password field, type the user's password; this must be 12 characters or less in length. You do not have to enter the user's current password, as they might have forgotten it and therefore it is possible that nobody can provide that value. In the Retype new field, type the user's password again, for confirmation. A 'Password Changed' message displays. Click on the OK button.